So Tower Hamlets more than made up for the (somewhat) lacking bowl at Mile End with this monster of a bowl. 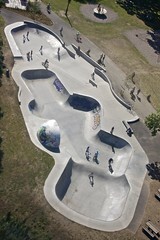 An amazing cradle and some sick lines, this park is really a draw for visitors to London. In contrast to the rather intimidating bowl there are some fun bits and bobs for those still learning. Great location. The overall facility here, including the play park and cafe are an example of how it should be done to attract a mixed crowd of families, the youth and the older riders.